Today marks the 35th anniversary of the fall of Saigon and the end of the Vietnam war. Occasionally I wander and this post has nothing about motorcycles. However, it has everything to do with appreciating veterans. You may recall that the U.S. entered the war to prevent a communist takeover of South Vietnam as part of their wider strategy of containment. The southern city of Saigon – later renamed as Ho Chi Minh City – was surrendered on 30 April 1975 to Vietcong troops when several tanks smashed through the gates of what was then known as Independence Palace and the last of the Marines were evacuated from the embassy roof. The 6th Missile Battalion (HAWK), 71st Artillery was activated by General Order 17, dated 19 February 1962, Headquarters, U.S. Army Air Defense Center, Fort Bliss, Texas. The HAWK – from the Latin name Accipter (birds that are known as hawks) – were made by Ratheon, and was an all-weather, surface-to-air, medium-range/medium-altitude missile system. All HAWK missile artillery battalions served under the 97th Artillery Group (Air Defense Artillery) — “Hoomau i Luna” (Always On Top). It would be three years later in July 1965 that the Battalion received Alert Orders for overseas deployment to U.S. Army Pacific (USARPAC) South Vietnam. The alert order initiated a series of actions to qualify the crews and readied the equipment for deployment. In less than a month, the Battalion had multiple successful missile exercises and by 15 August 1965 the equipment was ready for shipment. The PRD (Personnel Readiness Date) was established as 1 September 1965 and all personnel were POR qualified. The Battalion’s personnel were alerted for movement from Fort Bliss, Texas to Oakland Army Terminal, Oakland, California. The main body (including my father) of the 6th Battalion (HAWK), 71st Artillery departed Oakland Army terminal aboard the USNS General Hugh J. Gaffey (T-AP-121) on 11 September 1965. My father mailed me the above card which I’ve saved as a reminder of that voyage. And in a twist of irony the ship turned out to be the very same troop transport ship that he traveled to Asia when deployed to serve in the Korean War some twelve years earlier. Go figure. 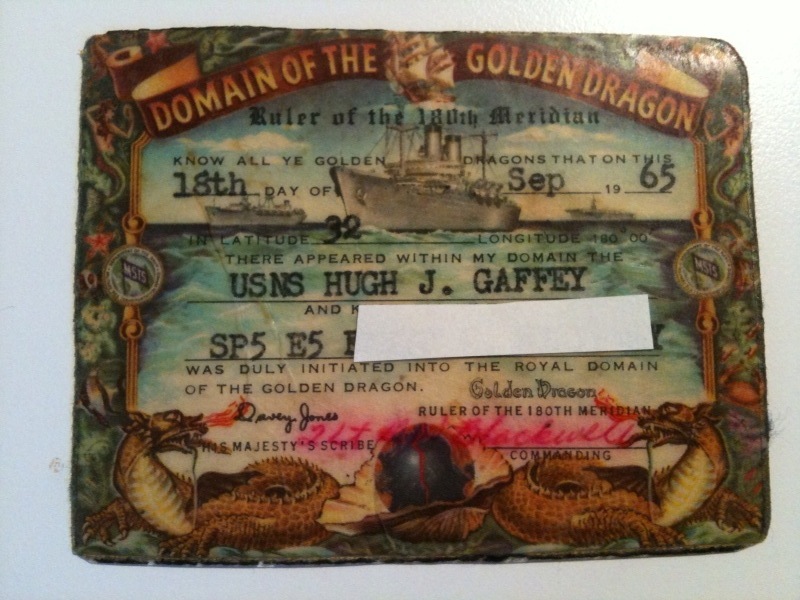 At any rate, on the card above (name intentionally blocked out) you’ll note that at departure my father wore a Specialist E-5 Insignia, indicating the rank of Specialist E-5, or Spec 5 as it was commonly called. It was phased out after the Vietnam War and today, all E-5’s are Sergeants, but during the Vietnam War, Spec 5’s were sometimes squad leaders or in charge of technical groups. Most E-5’s in a Hawk Battery were senior radar or missile technicians and they reported to an E-6 or above maintenance Sergeant. Interestingly an E-5 was the highest rank a draftee could receive without re-enlisting. The E-5 in charge reported directly to the Maintenance Warrant Officer and functioned as the Sergeant in their chain of command. So, why were HAWK missiles in Vietnam? It turns out that in 1965 the U.S. significantly increased the scale of its air strike operations against North Vietnam, and in response the North Vietnamese were using Mig-17’s with a top speed of over 1300 MPH and could suddenly pop up on radar screens without much notice. In addition they deployed Russian Il-28 bomber aircraft which had the potential for first strike. 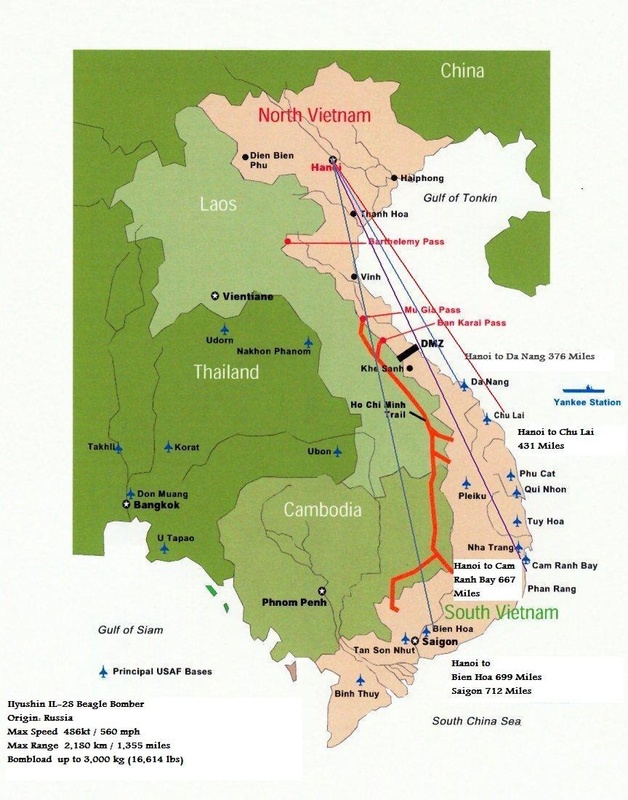 The heightened air threat from North Vietnam and the lack of allied low altitude radar coverage in the region meant that if the enemy wanted to exploit this weakness it was estimated that the bases in South Vietnam and north-east Thailand would be open to decimating attacks in minutes. As a result, the 6th Missile Battalion men were deployed in various locations across Vietnam to defend their assigned air bases, fuel and ammo dumps, cities, major troop concentrations areas and free world ports in the Republic of South Vietnam. My father along with rest of the 71st Artillery debarked at Qui Nhon after 17 days aboard the USNS General Hugh J. Gaffey (T-AP-121) on 28 September 1965. In November 1965, Battery C, 71st Artillery became the first fully operational HAWK unit in Vietnam. In 1966 the battalion relocated to Cam Ranh Bay where it remained until departure. During the first six-months my father served as an Engineer Equipment Technician and Supervisor, however, in the final six-months he was assigned to the 41st Signal Battalion as a M60 “Door Gunner” on a UH-1 “Slick” Huey. The “Slick” version was the configuration used for carrying maximum troops and other than the M60’s was not fitted with external weapons to save on weight. The unit received numerous Vietnam citations ranging from Defense; Counteroffensive; Tet Counteroffensive and Consolidation. 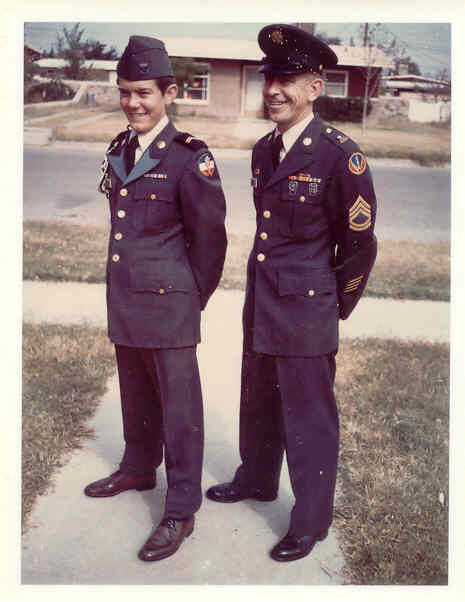 My father returned to Fort Bliss, Texas in September 1966 and retired some ten years later. “Private First Class Popp’s squad was conducting a squad-size patrol against the Viet Cong forces in Quang Nam Province. While moving along a trail in search of the enemy, the squad was suddenly taken under a murderous volume of small-arms, hand grenade and 40 millimeter grenade fire. The heavy volume of fire rained in from three sides,…continuation HERE…or HERE”. But, what about that ship you ask? It turns out the Admiral W.S. Benson-class troop transport – USNS General Hugh J. Gaffey (T-AP-121) – was built at Bethlehem Steel in Alameda, California and its history dates back to WWII where Admiral W. L. Capps made several trans-Pacific voyages to the Far East with troops between November 23, 1944 and August 4, 1945. Then from September 1945 to December 15, 1945, it made three trans-Atlantic voyages returning troops to and from Europe. In the 1950 – 60’s, the ship had a diverse service record where it spent almost two decades carrying men and material to American installations throughout the Far East and the Pacific Ocean during the Korean and Vietnam War support. The ship was placed out of service and struck from the Naval Register, 9 October 1969 and then transferred to the Maritime Administration for lay up in the National Defense Reserve Fleet. The ship was then reacquired and reinstated in the Naval Register on 1 November 1978 and was placed in service as a barracks hulk in Bremerton, WA., to serve as a barracks ship for the crews of ships undergoing major overhaul. Later the ship was laid up in the NISMF Pearl Harbor, HI., and struck from the Naval Register on 25 October 1993. In the ultimate irony, her final duty was a missile target North of the Hawaiian Islands during the RIMPAC 2000 EXERCISE where she sank on 16 June 2000, at location, in a depth of 2,730 fathoms. Sure I’m proud of our family’s military service, but this post is more than that. 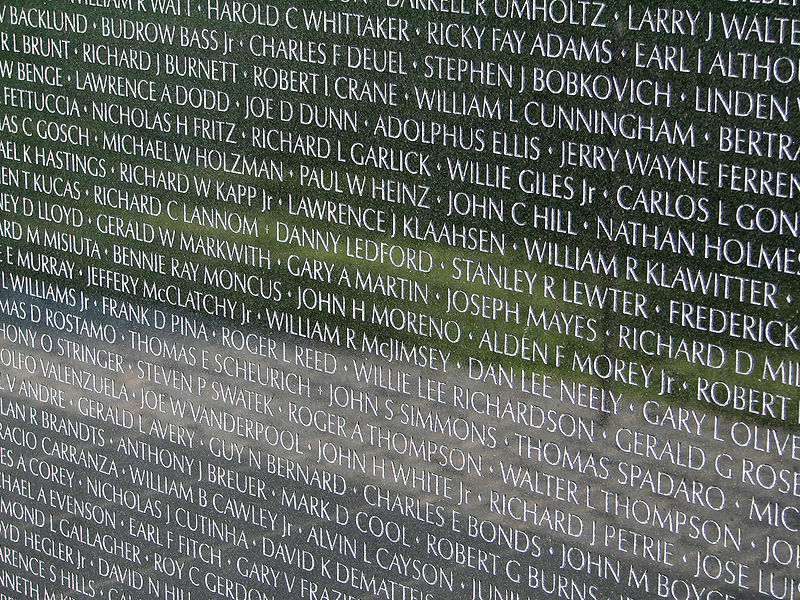 It’s about remembering the fallen of the Vietnam War. Many came back to a non-welcome committee and deserve a major shout out. There are Veteran Motorcycle Clubs and many independent riders across the U.S. who are dedicated to helping and honoring veterans. If you are one thank you. If not, then when you see a Vietnam Vet or any Vet for that matter, try and make a point to thank them for their service to our country. Believe me they’ll appreciate hearing it! Research for this post courtesy of: Army; BBC; 6th Battalion, 56th Artillery; GruntsMilitary.com; Global Security Org; General Orders and Code of Conduct; Military Personnel Records; Wikipedia; Navy; and family history. Note: Photo of me above taken in El Paso, TX., circa; 1969 or ’70 and I’m in a ROTC uniform. 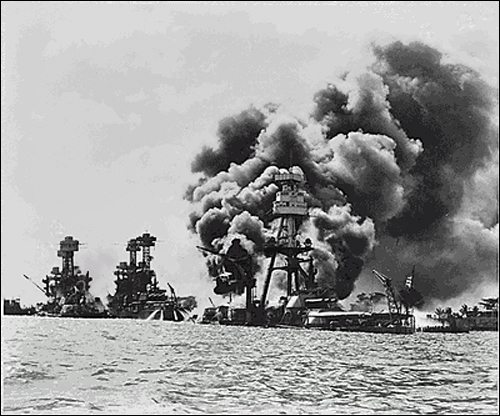 It was 68 years ago today – December 7, 1941 – that bombs fell on Pearl Harbor. It was a stealthy attack that took the lives of more than 2,400 Americans, threaten internment of 150,000 people of Japanese ancestry in Hawaii and was a tipping point for the nation which jumped headlong into its 2nd major war of the century. It was a day filled with sacrifices and heroism – one that should not be forgotten. Very little is known about the specifics and mindful of the results Harley-Davidson isn’t doing much talking. It bears a similarity to the clandestine support the U.S. provided Muslim fighters during the 10-years the U.S.S.R. fought in Afghanistan. Maybe that’s an overreach? At any rate, the highly ironic consequence of Milwaukee’s quest for export markets in the 1920s resulted in helping Japan ready for World War II. It was during the “economic slump” of the 1930s that the creation of a Japanese big twin occurred. It’s known that during the 1920s, Arthur Davidson had aggressively pursued new sales openings, including the establishment of the Harley-Davidson Sales Company of Japan. It had a comprehensive network of dealers, agencies and spares. 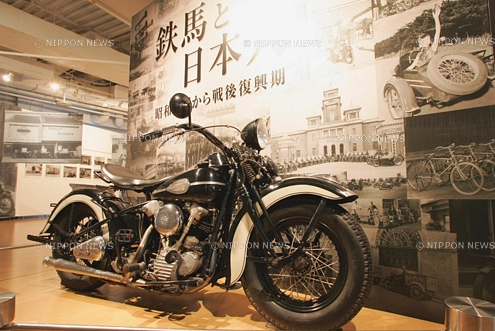 In fact, the Milwaukee motorcycle stood so high that Harley’s soon became Japan’s official police motorcycle. The motor company was skeptical, but Childs’ persistence finally convince management and the first overseas factory began production at Shinagawa, near Tokyo. Motorcycles built with tooling, plans, blueprints and expertise directly from Milwaukee — Harley-Davidson built a factory that was considered the most modern in the world. By 1935 Shinagawa was manufacturing complete motorcycles, mainly 74-inch V-series flathead twins. In 1930, these had become the official motorcycle of the Japanese Imperial Army. Later, when the army became the effective civil power, it declined the chance to convert production to the new OHV Knucklehead, preferring the proven durability of the H-D side-valve twin. It was at this point that the Sankyo corporation forcibly took over control of the “H-D” factory and began selling Japanese Harleys under the Rikuo name. The “74” twin became the Rikuo Model 97. As it became clear that Japan readied for World War II, Harley cut its losses and got out. As military demand increased (especially after the Japanese invasion of China in 1937), Rikuo sub-licensed the product to Nihon Jidosha (“Japan Combustion Equipment Co.”). Its “Harleys” were variants of the model 97s, entitled Kuro Hagane (“Black Iron”). Eerily, the factory had only a few more years to run. Nihon Jidosha was located in Hiroshima. Yokohama Kanagawa Prefecture photos of Japanese Harley History HERE. Classic Bike article (1998) by Hugo Vanneck HERE. Rikuo (Riku’O) Motor Web Site HERE. FBI History 1930 – 1945 HERE. Photo courtesy of Nippon News and National Archives. Having dealt with the pesky issue of war Nobama issued an even-handed “restraint” statement then turned to the more pressing matter of his Hawaiian (Kailua) vacation. I know this is subjective, but his thing for old-school eats as a local grindz type guy looks bad and devoid of feeling for the Georgian situation. The Russians must have been inspired by that “body surfing” comment and ramped up their military offensive. With estimates of 2000 people killed and only 100,000 civilians fleeing their homes I guess they won’t be satisfied until Tskhinvali is in ruins or the oil market spikes (again!) as BP is shutting down the pipelines in the region. Meanwhile back here in the capital-focused world where it’s all about thinking up intriguing and fascinating ways to make money through brands we have a pointless and meaningless exercise to comprehend…sort of a WWE Tournament with logo’s. Fortune Magazine conducted a logo competition among the most powerful Fortune 500 brands. Siegel+Gale identity experts Howard Belk and Sven Seger were called upon by Fortune to judge which of the many logos were deemed worthy of the #1 spot. Harley beat out John Deere but lost the overall tournament. I call major foul! It’s an upside down world as everyone knows there is only one corporate logo distinctive and cool enough to wear on your body and that would be Harley-Davidson. Logos belong to their respective owners and used courtesy of Fortune magazine. The sun, the sand, the sound of waves crashing on the beach – huh? I took a week+ off from blogging and fully enjoyed vacation in the tropics. I did the entire relax by the pool with SPF-30, read books, caught up on local Oahu news and ordered lots of refreshments with large slices of Pineapple! One book I read that I wanted to mention was by John Wood. He released a memoir entitled Leaving Microsoft to Change the World. At the pinnacle of his career he departs Microsoft to start Room-to-Read and lays the groundwork for a long-term vision of world change. Great book and I admire his life-altering decision to leave the corporate world to create a non-profit. The trip was not on a Harley. I worked real hard to avoid traffic and driving, yet with temperatures ranging between 78-81 degrees a “HOG” ride was on my mind. I toured the Island of Oahu with my “Island Girl” from the beaches of Waikiki, through the windy mountain roads and around the island to the North Shore…all in a rental car. 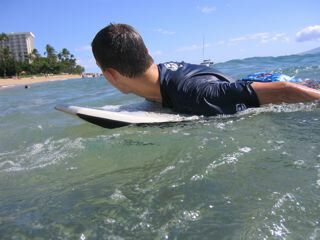 Sure, I found a bit of paradise on Oahu and managed to take some pictures…my other hobby. Honolulu has grown leaps and bounds over the years, and today even more skyscrapers are filling the tropical island. The city itself is impeccable and a shopping mecca. It’s a special place and the people are friendly and its natural beauty and unique culture is what draws me back. After all Oahu is famous for its miles and miles of white, sandy beaches, but one can’t help but think how every day is a Harley day in Hawaii.